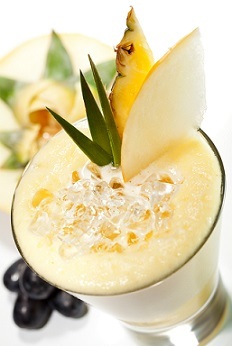 This Pina Colada Recipe gives you a sweet, light rum-based cocktail with cream of coconut, pineapple juice and a garnish of pineapple and a maraschino cherry. Omit the rum and you have a Virgin Piña Colada. Supposedly the beverage was created in 1957 by a San Juan bartender who sought to capture the unique flavors of Puerto Rico in an alcoholic beverage. Gather up your tools and ingredients and let’s get it made! Pour into a Hurricane glass or specialty glass and garnish with a pineapple wedge and maraschino cherry. The restaurant guests love to order this drink to sip while sitting on the restaurant patio on a warm evening. This beverage and Margarita recipe are two of the most popular restaurant drink recipes year long. Enjoy your restaurant cocktail recipe and the company of those you share it with!